Money is any good or token that functions as a medium of exchange that is socially and legally accepted in payment for goods and services and in settlement of debts. Money also serves as a standard of value for measuring the relative worth of different goods and services. Some authors explicitly require money to be a standard of deferred payment. Money is one of the most central topics studied in economics and forms its most cogent link to finance. In common usage, money refers more specifically to currency, particularly the many circulating currencies with legal tender status conferred by a national state; deposit accounts denominated in such currencies are also considered part of the money supply, although these characteristics are historically comparatively recent. Money may also serve as a means of rationing access to scarce resources and as a quantitative measure that provides a common standard for the comparison and valuation of quality as well as quantity, such as in the valuation of real estate or artistic works. The use of money provides an easier alternative to barter, which is considered in a modern, complex economy to be inefficient because it requires a coincidence of wants between traders, and an agreement that these needs are of equal value, before a transaction can occur. The efficiency gains through the use of money are thought to encourage trade and the division of labour, in turn increasing productivity and wealth. iron sticks were used in Argos, before Pheidon's reforms. cowries were used as a money in Africa (up until 19th Century), ancient China and throughout the South Pacific. salt was used as a currency in pre-coinage societies in Europe. ox-shaped ingots of copper seem to have functioned as a currency in the Bronze Age eastern Mediterranean. rum-currency operated in the early European settlement of Sydney cove in Australia. cash crops such as tobacco, rice, wheat, indigo, and maize were used as money in colonial Virginia. Under a commodity money system, the objects used as money have intrinsic value, i.e., they have value beyond their use as money. For example, gold coins retain value because of gold's useful physical properties besides its value due to monetary usage, whereas paper notes are only worth as much as the monetary value assigned to them. Commodity money is usually adopted to simplify transactions in a barter economy, and so it functions first as a medium of exchange. It quickly begins functioning as a store of value, since holders of perishable goods can easily convert them into durable money. Coins are commonly used for the smaller denominations of a country's currency system. In the United States for example, coins come in 1, 5, 10, 25, and 50 cents, and also 1 dollar. In Europe, coins come in 1, 2, 5, 10, 20, and 50 euro cents, and also 1 euro and 2 euros. The larger denominations of currency in both regions consist of paper money. The same general phenomenon can be observed in the Philippines, Mexico, Singapore, China, Canada, South Africa, and many other societies throughout the world. The bulkiness and limited transportability of some forms of commodity money. This led to the invention of symbolic substitutes for commodity money. Goldsmiths' receipts became an accepted money-substitute for gold in 17th Century England. The goldsmiths were the precursors of leading banks in England and the receipts they issued were the precursors of the banknote. During the 19th Century commercial banks in Europe and North America issued their own banknotes based on the same principle of partial backing. In the US, the Free Banking Era lasted between 1837 and 1866. By the end of the 19th century, however, most countries prohibited private issues of banknotes or brought private issuers under the control of central banks. Banknotes (also known as paper money) and coins are the most liquid forms of symbolic money and are commonly used for small person-to-person transactions. There are also less tangible forms of money, which nevertheless serve the same functions as money. Cheques, debit cards and wire transfers are used as means to more easily transfer larger amounts of money between bank accounts. Electronic money is an entirely non-physical currency that is traded and used over the internet. The invention of symbolic substitutes for money further loosened the association between money and barter and opened the way for fiat money. Fiat money is currency that has negligible inherent value and is not backed by any commodity. A central authority (government) creates a new money object by issuing paper currency or creating new bank deposits. The widespread acceptance of fiat money is most frequently enhanced by the central authority mandating the money's acceptance as legal tender and demanding this money in payment of taxes or tribute. By the early 1970s almost all countries had abandoned the gold standard and converted their national currencies to pure fiat money. Today, gold is commonly used as a store of value, but is not often used as a medium of exchange or a unit of account. But central banks do use gold as a unit of account. Today's national currencies are backed by the governments that issue them, not by gold or silver, and the governments are backed by the productive capacity of the societies they represent. During the 20th century, it was normal for all independent states to have their own national currency, managed by a central bank. In 1999, however, a number of countries in the European Union adopted a common currency, the euro. From 1999 to 2002, the euro was a common unit of account co-existing with national currencies which continued to circulate. In 2002, euro-denominated notes and coins were issued, and rapidly displaced the previous national currencies, including the French franc, German mark and Italian lira. In addition, a number of countries including Ecuador and El Salvador have adopted the policy of dollarization, abandoning the national currency in favour of that of another country, most commonly the United States dollar. Economic analysis of currency unions focuses on two issues. The theory of optimum currency areas deals with the extent to which countries or regions experience common economic shocks and can therefore benefit from a common monetary policy. Countries with high levels of trade and similar economic structures may benefit from a currency union. The literature on central bank credibility deals with the conditions under which central banks can make a credible commitment to avoid inflation. When these conditions are not met, dollarization may be an appropriate policy response. Bloomberg L.P. lists the following major currencies used in trading. In addition, the Chinese Renminbi is an important currency in international trade, but trade in financial markets is subject to central bank restrictions. The evolution of money illustrates how each new social institution creates linkages with other existing social institutions as it develops and those linkages gradually expand into complex networks of relationships until they become inseparable elements of a single social web. The evolution of money began as a medium of exchange and measure of value money, thus serving as a stimulant for the exchange of goods and services. It has ended as a force for restructuring political and social relationships. Over time, money has helped breakdown the rigid class structure which allocated privileges according to one’s birth. In a money economy access to goods and services is based on the capacity to pay rather than one’s social origins. Thus it helps eliminate social discrimination based on caste and class. As a medium for storage of value, it gave rise to banking. Banks pooled economic resources, and provided a legal structure for transporting money over great distances. This in turn allowed the development of capital intensive trade routes around the globe. At a later date, pooled capital permitted large scale investments in productive capacity and infrastructure, thus facilitating the industrial revolution. Money has also changed political and social structure. The ever increasing need of that government for more funds created the need for taxation and made governments increasingly dependent and subject to those sections of society that possessed or controlled large sums of money. The right to collect taxes initially helped monarchy centralize power and influence in a national government. The English Parliament eventually wrested power from the king by first acquiring the sole right to raise taxes, paving the way for democracy. Money has also played an important role in population migrations and the shifting balance of power between individuals, the state and religious institutions. The desire to add Jewish wealth to Catholic and Spanish treasuries helped trigger the Spanish inquisition. Many Catholics fled England after Henry the 8th dissolved the catholic monasteries and confiscated their treasuries. The need for large sums of money helped limit the power of absolute monarchs and caused the realignment of social roles. Despite their philosophical and religious claims, to absolute power the monarchs of the middle ages were frequently dependent on wealthy bankers and traders for the funds to wage war. This forced a limited form of power sharing and rule by consensus. In some cases, particularly in Italy, oligarchies of rich merchants, rather than hereditary rulers governed. Money is generally considered to have the following characteristics, which are summed up in a rhyme found older economics textbooks and a primer: "Money is a matter of functions four, a medium, a measure, a standard, a store." There have been many historical arguments regarding the combination of money's functions, some arguing that they need more separation and that a single unit is insufficient to deal with them all. Financial capital is a more general and inclusive term for all liquid instruments, whether or not they are a uniformly recognized tender. It should also be recognizable as something of value. Person A should recognize the value of the item so that Person B can give it to A in exchange for goods or services. It should be easily transportable; precious metals have a high value to weight ratio. This is why oil, coal, vermiculite, or water are not suitable as money even though they are valuable. Paper notes have proved highly convenient in this regard. It should be durable. Money is often left in pockets through the wash. Some countries (such as Australia, New Zealand, Mexico and Singapore) are making their bank notes out of plastic for increased durability. Gold coins are often mixed with copper to improve durability. It should minimize contamination and contagion. Since money is frequently handled it becomes a pathway for infectious disease transmission. Recent studies have shown that the area in business offices that show the highest contamination by disease causing organisms is the accounting office where money must be counted and handled. A unit of account is a standard numerical unit of measurement of the market value of goods, services, and other transactions. Also known as a "measure" or "standard" of relative worth and deferred payment, a unit of account is a necessary pre-requisite for the formulation of commercial agreements that involve debt. Divisible into small units without destroying its value; precious metals can be coined from bars, or melted down into bars again. This is why leather and live animals are not suitable as money. Fungible: that is, one unit or piece must be exactly equivalent to another, which is why diamonds, works of art or real estate are not suitable as money. A specific weight, or measure, or size to be verifiably countable. For instance, coins are often made with ridges around the edges, so that any removal of material from the coin (lowering its commodity value) will be easy to detect. To act as a store of value, a commodity, a form of money, or financial capital must be able to be reliably saved, stored, and retrieved - and be predictably useful when it is so retrieved. Fiat currency like paper or electronic currency no longer backed by gold in most countries is not considered by some economists to be a storage of value. It should be long lasting and durable; it must not be perishable or subject to decay. This is why food items, expensive spices, or even fine silks or oriental rugs are not generally suitable as money. It should have a stable value. It should be difficult to counterfeit, and the genuine must be easily recognizable. The fourth and final function of money, as a means of liquidity. It is important for any economy to move beyond a simple system of bartering. Liquidity describes how easy it is an item can be traded for something that you want, or into the common currency within an economy. Money is the most liquid asset because it is universally recognised and accepted as the common currency. In this way, money gives consumers the freedom to trade goods and services easily without having to barter. Liquid financial instruments are easily tradable and have a low transaction costs. There should be no or minimal spread between the prices to buy and sell the instrument being used as money. In economics, money is a broad term that refers to any instrument that can be used in the resolution of debt. However, not all money is created equal. One early theoretician, Ludwig von Mises, argued for the importance of distinguishing between three types of money: commodity money, fiat money, and credit money. Each carries different economic strengths and liabilities - a point driven home in his book The Theory of Money and Credit. Modern monetary theory also distinguishes between different types of money, using a categorization system that focuses on the liquidity of money. Commodity money is any money that is both used as a general purpose medium of exchange and as a tradable commodity in its own right. Commodity based currencies are often viewed as more stable, but this is not always the case. The value of a commodity based currency as a medium of exchange depends on its supply relative to other goods and services available in the economy. Historically, gold, silver and other metals commonly used in commodity based monetary systems have been subject to regular and sometimes extraordinary fluctuations in purchasing power. This not only damages its stability as a medium of exchange; it also reduces its effectiveness as a store of value. In the 1500 and 1600's huge quantities of gold and even larger amounts of silver were discovered in the New World and brought back to Europe for conversion into coin, the purchasing power of those coins fell by 60% to 80%, i.e. prices of commodities rose, because the supply of goods for sale did not keep pace with the increased supply of money. In addition, the relative value of silver to gold shifted dramatically downward. More recently, from 1980 to 2001, gold was a particularly poor store of value, as gold prices dropped from a high of $850/oz. to a low of $255/oz. The advantage of gold and silver, however, lies in the fact that, unlike fiat paper currency, the supply cannot be increased arbitrarily by a central bank. It is also possible for the trading value of a commodity money to be greater than its value as a medium of exchange. When this happens people will often start melting down coins and reselling the metal used to make them. This has happened periodically in the United States, eventually causing it to move away from pure silver nickels and pure copper pennies. Shipping coins from one jurisdiction to another so that they could be reminted was sometimes a lucrative trade before the advent of trusted paper money. Commodity money's ability to function as a store of value is also limited by its very nature. Copper and tin risk rust and corrosion. Gold and silver are soft metals that can lose weight through scratches and abrasions. Stability aside, commodity based currencies are limiting in a rapidly growing or very active economy. The supply of money in an economy must be equal or greater than the volume of trade. If commodities are used as money, then the money supply must equal the total amount of goods and services sold. In a large economy, the volume of trade can easily outstrip the supply of any one commodity. This problem is compounded by the fact that money also serves as a store of value. This encourages hoarding and takes the commodity money out circulation, reducing the supply. The supply of circulating commodity currency is further reduced by the fact that commodity moneys also have competing non-monetary uses. For example, gold and silver is used in jewelery and nickel and copper have important industrial uses. Commodity based currencies also limit the geographic extent of the trading market. To make large purchases either a large volume or a high weight or both of the commodity must be transported to the seller. The cost of transportation of the currency raises the transaction cost and makes long distance sales less attractive. Fiat money is any money whose value is determined by legal means rather than the relative availability of goods and services. Fiat money may be symbolic of a commodity or government promises. Fiat money provides solutions to several limitations of commodity money. Depending on the laws, there may be little or no need to physically transport the money - an electronic exchange may be sufficient. Its sole use is as a medium of exchange so its supply is not limited by competing alternate uses. It can be printed without limit, so there is no limit on trade volumes. Fiat money, especially in the form of paper or coins, can be easily damaged or destroyed. However, it has has an advantage over commodity money in that the same laws that created the money can also define rules for its replacement in case of damage or destruction. For example, the US government will replace mutilated paper money if at least half of the bill can be reconstructed.. By contrast commodity money is gone for good. Paper money is especially vulnerable to everyday hazards: from fire, water, termites, and simple wear and tear. Money in the form of minted coins is sometimes destroyed by children placing it on railroad tracks or in amusement park machines that restamp it. In order to reduce replacement costs, many countries are converting to plastic bills. For example, Mexico has changed its twenty and fifty pesos notes, Singapore its $2 and $10 bills, Malaysia with $1,$5,$10,$50 and $100, and Australia and New Zealand their $5, $10, $20, $50 and $100 to plastic for the increased durability. Some of the benefits of fiat money can be a double-edged sword. For example, if the amount of money in active circulation outstrips the available goods and services for sale, the effect can be inflationary. This can easily happen if governments print money without attention to the level of economic activity or counterfeiters are allowed to flourish. Perhaps the biggest criticism of paper money relates to the fact that its stability is highly dependent on the stability of the legal system backing the currency. Should the legal system fail, so would the currency that depends on it. Credit money is any claim against a physical or legal person that can be used for the purchase of goods and services. Credit money differs from commodity and fiat money in two important ways: It is not payable on demand and there is some element of risk that the real value upon fulfillment of the claim will not be equal to real value expected at the time of purchase. This risk comes about in two ways and affects both buyer and seller. First it is a claim and the claimant may default (not pay). High levels of default have destructive supply side effects. If manufacturers and service providers do not recieve payment for the goods they produce, they will not have the resources to buy the labor and materials needed to produce new goods and services. This reduces supply, increases prices and raises unemployment, possibly triggering a period of stagflation. In extreme cases, widespread defaults can cause a lack of confidence in lending institutions and lead to economic depression. For example, abuse of credit arrangements is considered one of the significant causes of the Great Depression of the 1930s. The second source of risk is time. Credit money is a promise of future payment. If the interest rate on the claim fails to compensate for the combined impact of the inflation (or deflation) rate and the time value of money, the seller will receive less real value than anticipated. If the interest rate on the claim overcompensates, the buyer will pay more than expected. 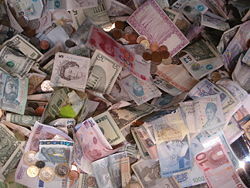 The money supply is the amount of money available within a specific economy available for purchasing goods or services. The supply in the US is usually considered as four escalating categories M0, M1, M2 and M3. The categories grow in size with M3 representing all forms of money (including credit) and M0 being just base money (coins, bills, and central bank deposits). M0 is also money that can satisfy private banks' reserve requirements. In the US, the Federal Reserve is responsible for controlling the money supply, while in the Euro area the respective institution is the ECB. Other central banks with significant impact on global finances are the Bank of Japan, People's Bank of China and the Bank of England. When gold is used as money, the money supply can grow in either of two ways. First, the money supply can increase as the amount of gold increases by new gold mining at about 2% per year, but it can also increase more during periods of gold rushes and discoveries, such as when Columbus discovered the new world and brought gold back to Spain, or when gold was discovered in California in 1848. This kind of increase helps debtors, and causes inflation, as the value of gold goes down. Second, the money supply can increase when the value of gold goes up, as this makes existing stocks of gold more valuable. This kind of increase helps savers and creditors and is called deflation, where items for sale are increasingly less expensive in terms of gold. Deflation was the more typical situation for over a century when gold was used as money in the US from 1792 to 1913. A failed monetary policy can have significant detrimental effects on an economy and the society that depends on it. These include hyperinflation, stagflation, recession, high unemployment, shortages on imported goods, inability to export goods, and even total monetary collapse and the adoption of a much less efficient barter economy. This happened in Russia, for instance, after the fall of the Soviet Union. For many years much of monetary policy was influenced by an economic theory known as monetarism. Monetarism is an economic theory which argues that management of the money supply should be the primary means of regulating economic activity. The stability of the demand for money prior to the 1980s was a key finding of Milton Friedman and Anna Schwartz supported by the work of David Laidler, and many others. Technical, institutional, and legal changes changed the nature of the demand for money during the 1980s and the influence of monetarism has since decreased. Money is universally valued; Money today is valued for the products and services for which it can be exchanged, the security it provides against unexpected needs, the economic power it generates, the political influence it exerts, the social status it offers to those who possess it, and also the self-confidence and sense of accomplishment it fosters in those who earn it. Theories abound to explain the economic value of money in terms of purchasing power. But in order to fully understand the value of money, economic theory is not sufficient. Money has acquired the all-pervasive value that it possesses today by a slow evolutionary process that can be most easily understood by tracing its social and psychological origins from ancient times. Money has to be viewed in a wider context as a social institution based on the consent of the population and as a psychological symbol based on the consent of the individual. "Money is worthless unless some people have it and others do not"